There are worse things than sitting on a balcony in an overwater bungalow listening to the rain and writing a blog in bora bora. It is a completely surreal experience. In fact, I have told my husband that it is such a breathtaking view that it is almost as if someone in Hollywood has created a virtual backdrop just to make my trip even better. This is paradise. This is the place that ruins the rest of the planet for you. This is the place that no matter where I go from now on I will be saying, "this is amazing but it's not Bora Bora." The local culture is fascinating and the people are the most genuinely friendly people I have ever met. It is probably because they are surrounded by a double ring of ocean. "Moana" (mo-a-nah) means ocean inTahitian. This moana is slightly different than the ocean that touches all other bodies of land. (And by all others, I mean ALL OTHERS). It's many different shades of blue and green and turquoise. I hate to use the word "unreal" because it is definitely real, but also definitely unimaginable. From the darkest navy blue to the lightest shade of turquoise that can exist without fading into white...that is the palette of blue that the Great Artist has used when creating this portion of the planet. The Tahitian islands were created on this planet about 3 million years ago. Earth is much older than that. I believe that Tahiti was an after thought for God. After he created this amazing big blue ball, he thought "dang. Wouldn't this have been a great idea...wait. I'm God. Who says it's too late to add the final touches to my masterpiece?" And then he created a small crack in the crust of earth's shell and let just enough lava pour through so that the Polynesian islands would be created. You did good God. Once again you knew what you were doing. Paradise. Simply put this is paradise. I know I'm not the first person to call Bora Bora paradise because it would be much like two people calling a banana a banana. So that brings the question I have been pondering: What is paradise? So it's got to happen. I must move my family here. I would be crazy not to. If I have truly found the place where my heart isn't longing for absolutely anything at all, why would I not pack up and move? Right? Life is so short and I'm about half way through with mine. And then it occurred to me. I have missed the big picture. It's not about Bora Bora, it is about me. The internal peace I feel in Bora Bora is simply because my senses are overwhelmed with beauty. As I have said, there is absolutely no room for any other thought process when you are here. Let's start with myself. I am a relatively intelligent, relatively attractive, strong willed and open-minded woman. In this analogy, I am Mt. Otemanu. I am rising high above my own little paradise and surrounded by beauty. Sometimes, rain clouds engulf me and I am unable to see the beauty of my world that is right within my reach but that does not mean it isn't there. It is definitely there. In my world, the beautiful lagoon can be found in my daughter's blue eyes. Captivating and calming, with the capability of drawing you in with one glimpse and never letting you go. A constant presence keeping you anchored and real. Giving me a reason to awaken each day, just so that I can be part of her world. Her spirit touches all of my shores, making me even more beautiful while doing so. The vast variety of ocean life from the sharks, to the manta rays, to the turtles and the small fish ...those are found in the spirit of my son. They all have the persistent need to live freely and exist beyond all limits. Qualities that remind me that I can do anything I want to do. That I shouldn't merely exist but that I should grab life and take it. That I should feel the fear and do it anyway. The ring of land that surrounds the island, the Motu, that is my husband's physical presence. Always there, always protecting the mountains, the lagoon and the sea life...protecting me, my daughter and my son. The people that inhabit this small island represent my husband's soul. Always smiling. Always lending a hand. Always embracing life. Loyal to their culture and their history they take a stand for what they believe and yet do not punish you for what you believe. My husband encompasses this type of humanity in his every move. He is the person that we should all strive to be. He is the type of person that I strive to be. He is just a higher quality of human being. So you see...it is all about perspective. 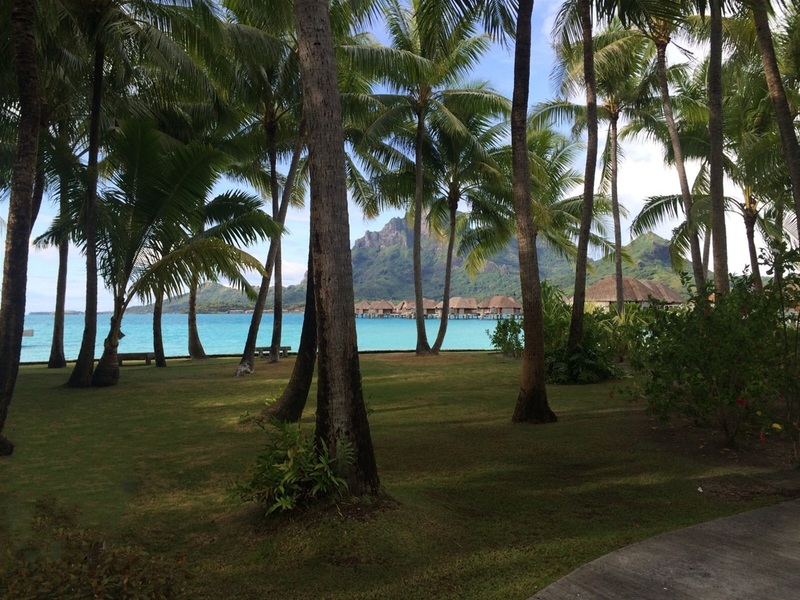 We all have the beauty of Bora Bora in our own lives, it is just harder to see. Sometimes we have to be willing to change our perspective. The beauty is sometimes harder to find but it is there. In a few days I will board a plane to leave the most magnificent slice of heaven that I have ever found. This place where the words Tahiti Nui mean so much more than "big Tahiti". The word Nui means infinite. All encompassing. Everything. Tahiti is everything. I would agree. Tahiti is everything. But I will be traveling home to my own little slice of heaven. A place where my own paradise awaits me every single day. And I cannot wait to embrace my life with a changed perspective. My own little paradise Nui awaits me, I just have to be willing to see it. PS- I am already saving money to return to Bora Bora. There is absolutely no way that I can finish my life without returning to this most magnificent island. I highly suggest that you do the same.